While this is not a quick recipe to prepare and requires making a bit of a mess in the kitchen, it is pretty simple to make, very frugal, and absolutely delicious! It's also great for entertaining company and can easily be doubled using a 9x13 baking pan. Everyone always love my version of Shepherd's Pie (even our kids--who hate mushrooms), so I hope you will enjoy it too! Brown ground chuck with chopped onions and drain, then set skillet aside while finishing the next steps. In three separate pots cook carrots, sauté mushrooms in a dab of butter and prepare mashed potatoes if not already done. Prepare gravy per package directions and add to ground beef, along with carrots and mushrooms. Cover and simmer on medium heat for a few minutes until thickened. Place beef mixture into a medium sized casserole dish and cover with mashed potatoes. Drag a fork over the top of potatoes and sprinkle with the amount of cheese desired. The more the better (just be sure to buy it on sale!) Place in 350-degree oven just long enough to melt the cheese. YUM!! 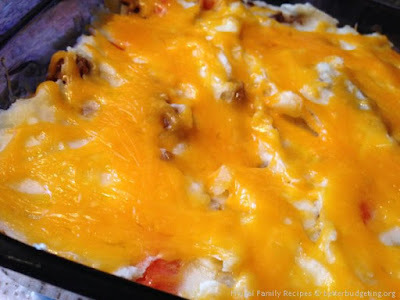 Mix the first three ingredients together, then mash 6 cooked potatoes (season as usual) and spread on top, then shred sharp cheddar cheese on top. Bake at 350 degrees for 20 minutes. ENJOY! The generic brands all work great. Brown the ground beef, drain, then add the soup. Keep on low heat for a few minutes, then add the veggies. I use a cast iron skillet so there is only one pan. Cover the beef and veggies with potatoes, then top with cheese. Bake in a 350-degree oven until cheese is melted. Brown 1 lb very lean hamburger with one large onion. Season to taste with salt and pepper. Add 1 can diced tomatoes (I use different flavors for variety.) Add 1 can green beans. Put in baking dish and top with mashed potatoes. Bake in 350-degree oven until it bubbles. Brown 1 lb Hamburger with 1 large onion. Add 1 can cream corn. Put in baking dish , cover with mashed potatoes. Bake in 350-degree oven until it bubbles. Recipe can be doubled. I believe I was told my Shepherd's Pie is backwards. I use leftover mashed potatoes. I line a 1 1/2 qt. casserole with the mashed potatoes. I brown a pound of hamburger with onions and add green beans, just to heat them up. I then put the hamburger with the green beans into the mashed potatoes and put mashed potatoes on top if I have some extra and brown it in the oven at 350 degrees until warm, which is usually 30 minutes. I like to add a little garlic and shredded cabbage to the ground beef and onion. It gives it a great flavor. Brown meat and mushrooms adding your favorite spices. Drain meat. In a bowl mix meat, soup mix, and can of soup together. Put in bottom of a casserole dish. Follow directions on box to make 4 servings of mashed potatoes. Top meat mixture with cheese (you choose the amount). Top cheese with mashed potatoes, then put more cheese on top of potatoes. Bake in a 350 oven for 30 minutes or until cheese is bubbly. This is so good! Brown the ground beef with the chopped up onion, season to taste with salt and pepper and drain, set aside. Boil the peeled potatoes till cooked (tender), then mash with butter, milk and garlic salt. Preheat oven to 350-degrees. Place ground beef in the bottom of a medium sized casserole. Now evenly spread the cream corn over the ground beef and then evenly spread the mashed potatoes over the cream corn. Drag a fork over the top of the potatoes and lightly sprinkle with paprika. Place casserole in the preheated 350-degree oven for about 45mins. Just a tip for Shepherd's Pie lovers who don't like onions... replace the onions by sprinkling a package of dry onion soup mix over the ground meat layer. All the flavor but no onion texture for the non-onion lovers. We use 2 lbs ground beef (cooked), 2 cans of creamed corn and mashed potatoes for top and bottom. Here's my recipe for Shepherd's Pie. Brown the turkey in a large skillet. Turn off the heat. Drain if you want to, but I don't. Stir in the onion soup mix. Fold in the green beans, corn, and carrots into the meat. In a separate sauce pan, prepare 2 envelopes of the instant mashed potatoes according to package directions. Dump the meat and vegetable mixture into a casserole dish. Spread the mashed potatoes over the mixture, covering everything. Bake at 350 degrees for 20 minutes. Total cost? About $4.00. I have been making this easy recipe since I got married thirty years ago, we still love it. Mix first three ingredients together and place in 8"square baking dish. Spread mashed potatoes over top, sprinkle with cheese. Bake at 350 until heated through and top is crusty. Serves 4. This recipe is so delicious, I even serve it to company. I use a pastry bag to pipe the mashed potato over the casserole to dress it up. Brown the Beef with the Onion and Garlic. Add some White Wine, and your favorite spices. Cook for a bit longer. Place this mixture in the bottom of medium sized casserole dish. In the same skillet that you cooked the beef, mix the two cans of corn together. Evenly spread the corn mixture over the ground beef and then evenly spread the mashed potatoes over the corn. Sprinkle with Italian Bread Crumbs. Bake in a 350-degree oven for about 30 - 45 minutes. I come from England growing up in the 40s and 50s. Shepherd's pie was a frugal dish made from leftovers of the Sunday roast. Sunday lunch was a big cooked hot meal with the prime meat of the week in those years of food rationing. On Monday the lunch was sliced cold roast with hot mashed potatoes and often cold beetroot in vinegar. Monday being washday Mother was too busy to fuss with fancy food. By Wednesday there still remained enough roast for it to be ground and made into a shepherd's pie. The meat was mixed with brown gravy (homemade of course) and fried chopped onion. If there was too little meat a can of baked beans was also added. The mixture was placed in a baking dish and covered with a good thick layer of mashed potato, and baked about 45 minutes at whatever the temperature happened to be in our cast iron oven. A vegetable in season was added. I still make the same recipe but use purchased ground beef or chicken and add a dash of Worcestershire sauce and cook in a modern oven at about 400 degrees for 35 minutes. Those were really frugal days. Brown the ground beef with the chopped up onion, season to taste with salt and pepper and drain, set aside. Boil the peeled potatoes till cooked (tender), then mash with butter, milk and garlic salt. Preheat oven to 350-degrees. Place ground beef in the bottom of a medium sized casserole. Now evenly spread the cream corn over the ground beef and then evenly spread the mashed potatoes over the cream corn. I think I've found a super quick way to make shepherd's pie that has a lot of favor. Chop up the pot roast into bite size pieces and place into a small baking dish. Also, add all of the juices that were in the package. Next layer the green beans on top of the meat. Spread the mashed potatoes over the top. Bake in a 350 degree oven for about 20 to 30 min. until it is bubbly on the sides. If using cheese pull it out during the last few minutes of cooking and sprinkle the cheese on. Put the dish back in the oven to melt the cheese. No need for extra spices because the pre-cooked roast has lots of favoring. I read all the pie recipes and here is the simple one that I make and my kids love. Add a small amount of oil to the bottom of a cast iron chicken fryer. Slice potatoes and onion. Layer alternately and season with salt and pepper and a little butter. Then add carrots and green beans. Season the hamburger and layer it on top of the vegetables. Put lid on top. Bake until the potatoes are done. Add the cheese to the top of the meat. Just melt it or put under the broiler and brown. The meat juices season the vegetables and the taste is out of sight. I gave no measurements for the ingredients, because you can just use what you have. A little is just right. A lot is ok too. Cook at 250 or at 350/375; whenever you want it done. Takes about 30 minutes at 350. Heat up some mushroom soup to use as a gravy and serve with a salad. My kids became very proficient at making this because there was no hard or fast rule about the ingredients or the time needed. My Mother-in-Law gave me this recipe and my kids L-O-V-E it!! Peel and cube potatoes and boil until done. Drain. Mash and mix potatoes your way. Meanwhile, brown ground beef, onion and seasonings on skillet. Drain grease from mixture. Stir in tomato paste and water. Heat to a boil. Reduce heat to simmer for about 5 minutes. Cover with mashed potatoes and serve. You can layer it a casserole dish and place in oven at 350 for about 10 min., if you like. I just serve it in the skillet. It saves clean up and time. I use leftover beef roast, pull apart and put on the bottom, cover with a can of mixed veggies. Then the mashed potatoes and pour gravy over and allow to flow to the bottom. If hamburger is used I suppose you could use a jar of gravy from the grocery store. It's great with leftover roast. Sometimes I make a roast just for shepherds pie. Lamb was used in old times but I never tried it. I like it with beef ya'll. 1. Brown ground beef in skillet. 2. Put ground beef into a 2-3qt. casserole dish, add a layer of shredded cheddar cheese. This is great, just add as much or as little as you'd like... however cheesy you'd like your dish! Next, add the whole kernel corn followed by the cream style corn. Add another layer of shredded cheese. Cover layers with mashed potatoes. 3. Place into oven at 350 degrees for 20-30 minutes, until warmed through and cheese is melted. We always have ours with cornbread or biscuits! ENJOY!! According to Webster's Dictionary, this is the correct spelling for Shepherd's Pie. It is also commonly misspelled as Sheperd's Pie, Sheperd Pie, Shepard's Pie or Shepard Pie. A shepherd is a person who herds and takes care of sheep (which I'm sure is where the meal-in-one recipe originated from), and Shepard is the last name spelling of Alan Shepard ( U.S. astronaut) and Sam Shepard ( U.S. playwright). After hearing from our readers we can plainly see that Shepherd's Pie is a very popular dish!